In the Down syndrome community there is a lot of talk about Olivia Wilde's video. On the front end, I want to thank Olivia for stepping out there with us. You simply rock. Thank you! Thank you for standing by our side. Thank you, Olivia, for believing with us that our children are amazing. Thank you for your voice. It seems another amazing woman has also decided to lend her voice. I'd love to hear your reactions (those who follow me) to these two videos. 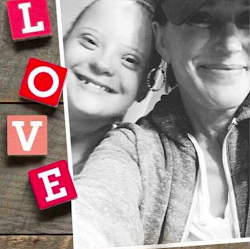 Both have amazing women advocating for individuals with Down syndrome. Both actually "star" a woman with Down syndrome. Thank you to both women. This entry was posted on Wednesday, March 23, 2016. You can follow any responses to this entry through the RSS 2.0. You can leave a response.